If you have decided to treat yourself with the exotic taste of Turkish coffee, then you simply must have the special equipment in order to prepare it. When I say “equipment”, I mean a Turkish-style coffee grinder, the right coffee pot, and of course if you are going that far, authentic Turkish coffee serving cups or perhaps even a whole set! 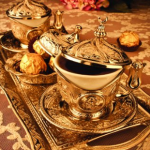 Having the total package will give you a taste of the exotic Turkish coffee experience, and perhaps make you feel a little bit more like you are sipping coffee in the streets of Istanbul, rather than well, not. Of course, in order to make great Turkish coffee its more than just owning all the right stuff to make it look the part. Here’s a video to get you started if you’ve never made coffee in the Turkish style before. 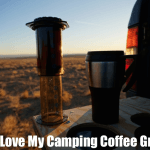 Now, back to the gear… In this article we want to look at what you’ll need to assemble what we call the ULTIMATE TURKISH COFFEE SET UP, starting appropriately with a Turkish style coffee mill grinder. Now, if you are really serious about making coffee in the genuine Turkish style, you need to start with the right coffee grinder for the job. 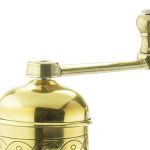 Today’s recommendation is our personal favorite of the Turkish-style coffee grinders that are out there, this manually-operated Zassenhaus coffee mill. 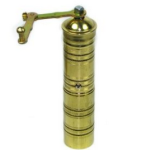 No, this not an automatic / electric grinder as you can probably see from the lovely handle, and it is made from polished brass and stainless steel giving it premium quality and precise operation. Once you remove the handle and the top lid and put the coffee beans inside (and then close it up) the grinding can begin. With a little manual effort, you can turn your fresh coffee beans to a finely-ground powder-like substance ready to be cooked in your pot. 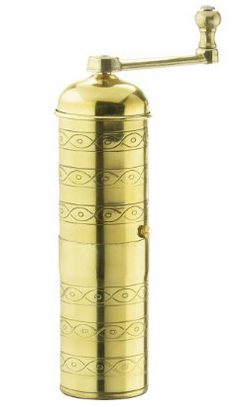 Turkish coffee requires the finest of coffee grinds, and that’s what this grinder excels at. Zassenhaus created this mill using hardened, high-grade steel that maintains excellent cutting edges. These sharp edges are what matters when your fresh beans go in, and the burrs begin their all-important job. While grinding, the coffee beans are ground gently and the coffee aroma and nutrients are not lost in the process. 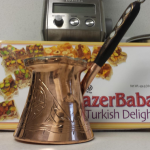 Ok, once you’ve chosen the best Turkish coffee grinder for the job of making authentic Turkish coffee, next you will need an equally well-made and authentic copper Turkish coffee pot. I think you’ll agree that this is a very extravagant looking coffee pot, or as they call it in Turkish, cezve (pronounced jaz-veh). Made by the company Bosphorus (named after a strait in Turkey that divides Europe and Asia) is made of copper, engraved all over its surface and it was hand made in Turkey by experienced artisans. This pot looks as though it has time traveled from the eighteenth or nineteenth century straight to my kitchen. The only drawback I think some people might have with this pot is that it is quite small actually; its capacity is only 3 demitasse cups. Personally, I don’t mind it, because I only tend to use it for myself. If I do use it for guests, and I have done this on occasion, what I do is I try to make the whole serving experience special for every person, serving just one person at a time. This cezve has a long, copper and wood covered handle that will help you take the pot off the cooker and poor the coffee without actually burning your hands. Just remember that the pot’s capacity is 8 Oz only. An empty pot weighs in at just 9 Oz while the diameter at base is 4 inches. The copper thickness is 2 mm. Expect that the water will boil super fast because this is a small pot and also you will have to supervise it yourself. Here is a quick video that shows how to use a Turkish coffee pot to make coffee in that particular way. The great thing about this Copper pot is that it requires only low to moderate heat in order to boil the water for your coffee. Another thing that you should pay attention to is the CopperBull logo that is imprinted on the bottom of the pot. If there is no logo on the bottom of the pot it is not the original product. Understandably, these people are proud of their product and so they make sure to let you know its authentic with their original logo. I love my Bosphorus Turkish Coffee Pot and it is now part of my Turkish coffee-preparing set-up that I use for myself or to serve guests, who are always impressed with both the coffee and the equipment. Remember, this is not a pot that is recommended to be cleaned in the dishwasher. This copper pot can simply be rinsed with water. 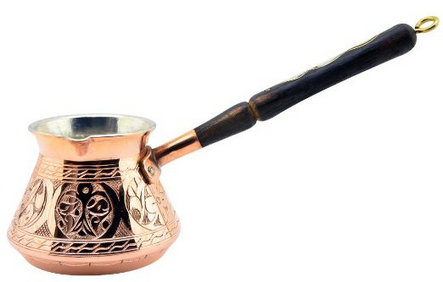 Now that we’ve looked at the best copper pot and coffee grinder made in the Turkish style, you can now go the whole 9 yards and get a Turkish coffee serving set to serve everything! They are a little pricey, but well worth it if you get the right one. Now, for the ultimate Turkish coffee set you will need actual authentically-crafted cups so you can serve it up properly. If you have ever visited Turkey or had a chance to drink coffee in a Turkish restaurant, you know that they love serve this delicious drink in tiny, well decorated cups. These are not your ordinary cups and saucers, that’s for sure. Forget about those big cups you are used to. This is not a coffee that you should drink a huge cup of at one time. This 6-piece set of tulip-embossed cups come with 6 espresso cups, saucer with a brass holder, and a lid that will keep your coffee hot. Richly ornamented with floral design, this is a set of 6 – 24 pieces of unique middle-eastern Ottoman coffee cups. You will get 6 porcelain inner cups with 6 brass cup holders, 6 saucers and 6 lids. Here, its all about the silver-embossed color. Being very small, these cups only contain 2 oz. If you think that they are too small, keep in mind that this is the way that Turkish coffee is served. Espressos and lattes can be served in these cups too, but they better be darn good to serve them up in a display this nice. While the porcelain cups are removable and suitable for dish washing, the other, ornamented parts are not recommended to be cleaned in the dishwasher. The rich design and their exotic look make these cups ideal for unique present for your loved ones. 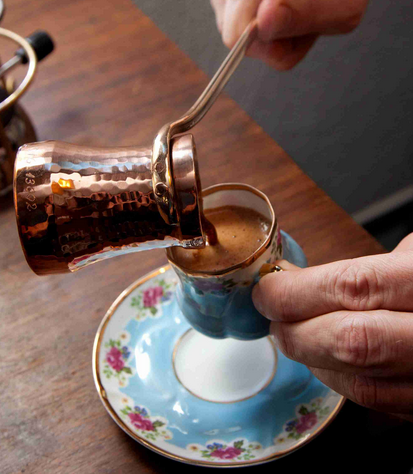 We hope that this gives you a head start on putting together your own ULTIMATE TURKISH COFFEE SET EXPERIENCE. 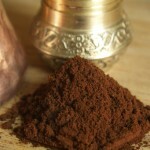 Below are a few videos that are related to Turkish coffee that you might like to see. 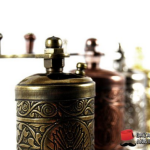 One is about making Turkish coffee, and one is about the history of Turkish coffee. Happy viewing! I am inspired to try this. I have the Turkish tea glasses and remember how lovely the Turkish coffee was and how the whole experience was enhanced by the lovely cups and the coffee pot and the attention paid to the correct service. Such attention to detail sadly lacking in our day-to-day existence.